Below are the new features / improvements released to Production during Q2-2017. These features and enhancements extend the usability and capabilities of the DemandCaster / Plex Supply Chain Planning platform. Issues related to bug and general performance improvements are addressed on an ongoing basis and are not included in these release notes. Please do not hesitate to reach out with any questions by contacting support. We have changed how options are managed. Though the settings are the same, we have now organized them as tabs and also provide the option when S&OP is enabled to apply the change to either S&OP or requirement planning. This provides great flexibility to decide when a planning attribute is applied. If an attribute is applied at the time of requirement planning it will be used the next time the supply plan is run. If the change is applied in S&OP it will be applied to requirement planning when the S&OP is approved. We have also reorganized and renamed some of the settings in each section to make them more intuitive and consistent across the platform. Here is a video we prepared as an overview. Clicking on Planner Action in the menu bar opens the last planner action and not the list of the current and previous planner actions. The planner action is now directly editable in the suggested order list. No need to edit orders in the item planning detail though this option remains. Please read the article Editing, Approving, and Ignoring Suggested Orders in Planner Action to learn more. A new ignore status has been added to hide a suggested order from the planner action list. You can now upload planners to be assigned to specific items. Includes references to open replenishment orders for expedites and make/purchase to orders. The item planning detail view has been reorganized to allow for information to be more easily accessible and settings managed. The General Item Analysis Tab has been removed in favor of just the Options Tab and a new Side Panel of metrics. Please read the article Item Planning Details Page Overview to learn more. We have added a new optional DRP / BOM feature called Constrained Planning. The premise is that the system will communicate your ability to meet demand based on current and planned available inventory through an items cumulative lead time. The documentation and video for this new optional feature is forthcoming. Please let us know if you would like to try this new planning feature. Notes may now be added to custom reports. When adding a note, simply check the box "Show note in reports" to include the subject in the report. More than one note may be included at a time in reports. To exclude the note, simply un-check the box. Days On Hand is now included in the supply plan as a row and also in the classification analysis. This is the measure of how many days of inventory is on hand based on the forward demand plan. In the Classification Analytic, the measure is name "Days of Forward Supply"
We added an Order Type option when setting up source / destination relationships that issues a purchase order between locations as opposed to a transfer order. The option is enabled in either multi-edit or the options tab of the destination location item. See image below of the items option tab. The same setting is located in the multi-edit settings interface. There is now a new setting " base level of safety stock." It will be used in case the calculated / whatever other SS option has a lower value. The option is enabled in either multi-edit or the options tab of the item. See image below of the items option tab. We have added the capability for each customers context demand plan to be run independently without affecting other contexts. 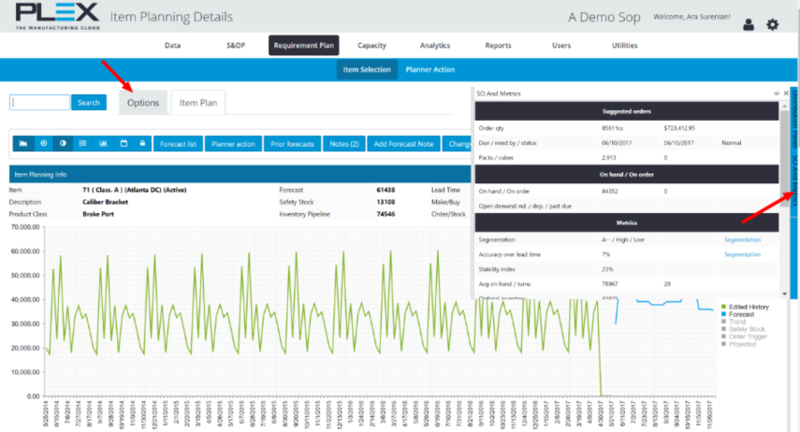 This allows users to manage demand plans in parallel. This is invisible to the end user so there is no new action required. For our S&OP users, we have added an Undo Button to the S&OP Change Log to easily undo unwanted changes. To learn more, read the article S&OP Change Log. For our S&OP users, we have added an option for a 5 year plan horizon increased from 3 years as the prior max horizon. The setting is located in System Settings under S&OP Planning Settings where you can choose the length of how far to view the plan in the app as well as how far out to statistically forecast. Please note that increasing the horizontal will slow the demand planning process a little due to the added time frame. 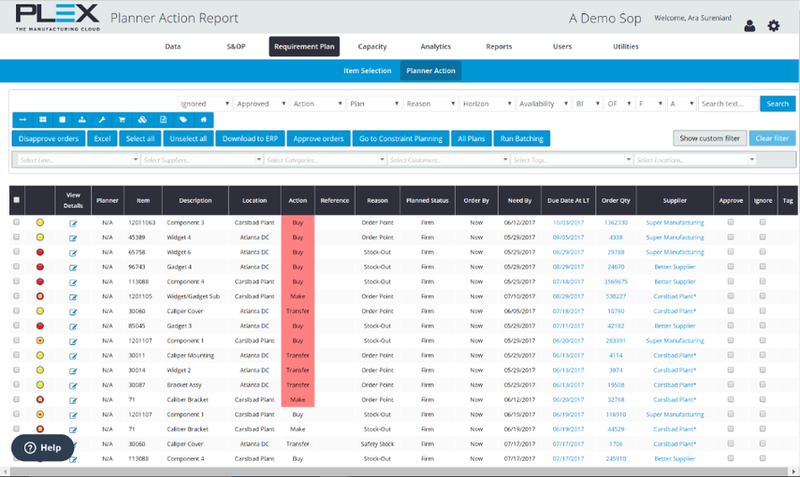 Finally, for our S&OP users, we have eliminated the need to run Pareto as a pre-requisite to run the demand plan. This is now part of the demand planning process with logic that defines when the Pareto should be run automatically. As you can see from the image below, the Run the Pareto step has been removed as well as the Pareto field in the progress bar.